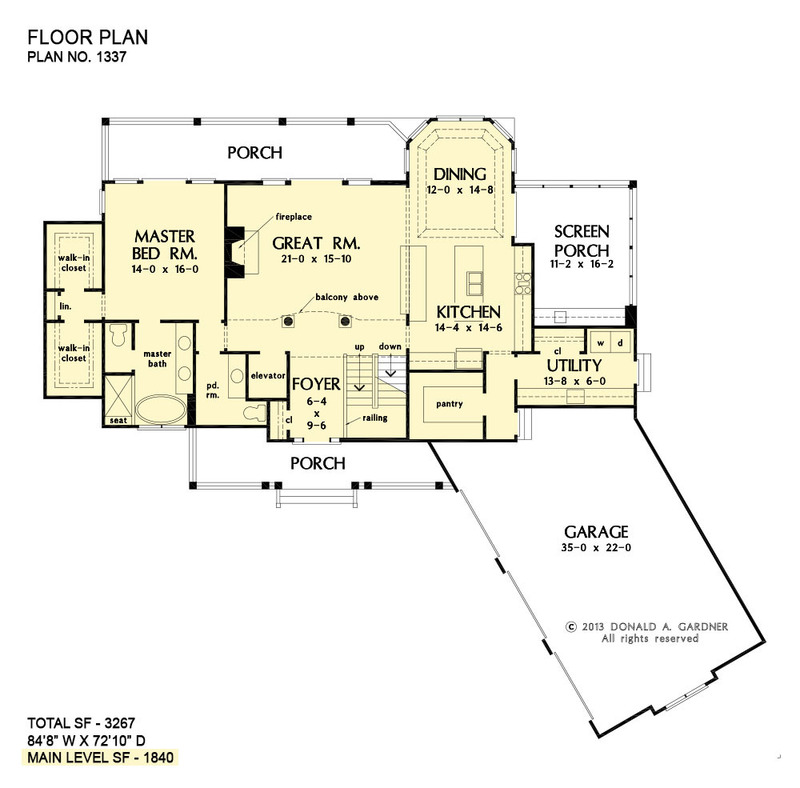 If you're looking for a Craftsman luxury home plan we invite you to review The Chancellor. An angled courtyard entry and large bracketed dormer provide a dramatic entry to this gorgeous hillside home. The massive central great room divides the master suite, with lavish bath and huge walk-in closets, from the public areas of the home. The large island kitchen is a chef's dream, and easily accesses a roomy pantry, a utility room with tons of counter space, and a bayed dining room with tray ceiling. A skylit screen porch with summer kitchen completes the main level. 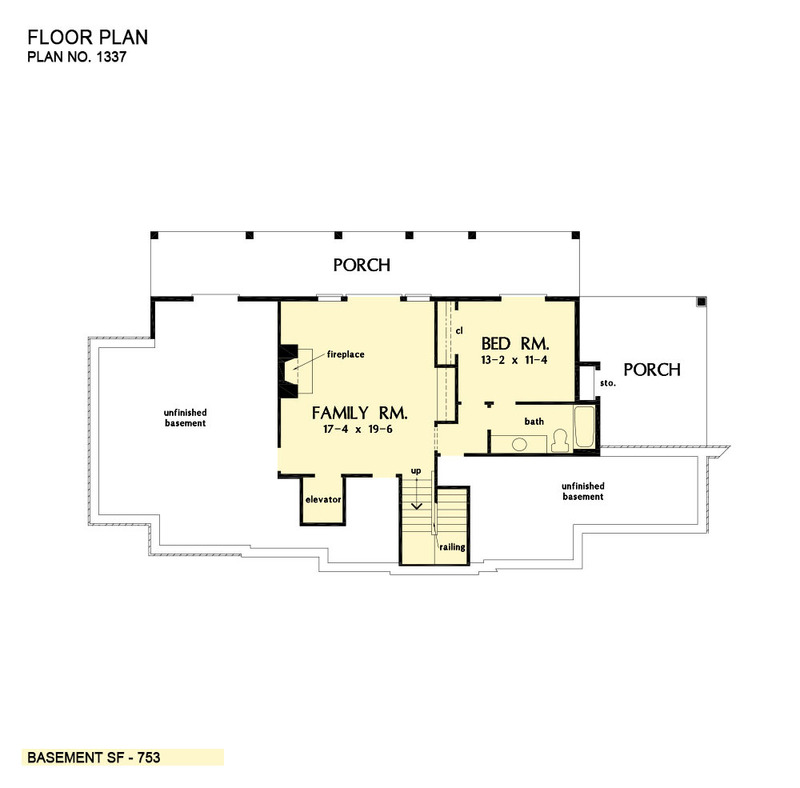 Upstairs, two bedrooms share access to a huge 543 sq. ft. bonus room. The lower level has another bedroom tucked away - perfect for guests or an older child - and a rec room with wet bar and fireplace. An elevator makes navigating the three levels a breeze for older family members. This home works for a large family, people who like to entertain and those who have in-laws or extended family staying with them. Indoors and out, this home offers all of the amenities you could want in a new home. 1st Floor: 1840 Sq. Ft. Bonus Room: 543 Sq. Ft. Unfinished Basement: 1005 Sq. Ft.
Porch - Screened: 221 Sq. Ft.
Porch - Rear Lower: 354 Sq. Ft.
Porch - Rear Upper: 266 Sq. Ft.
Porch - Lower Right: 221 Sq. Ft.
House Dimensions: 84' 8" x 72' 10"
Great Room: 21' 0" x 15' 10"
Porch - Rear Lower (Flat): 48' 4" x 7' 4" x 9' 7"
Porch - Rear Lower Right (Flat): 14' 4" x 17' 0" x 9' 7"
Balcony (Vaulted): 21' 0" x 3' 8" x 25' 0"
Family Room (Flat): 17' 4" x 19' 6" x 9' 5"
Storage (Other) (Flat): 2' 0" x 4' 0" x 9' 5"
Foyer (Vaulted): 6' 4" x 9' 6" x 25' 0"
Dining Room (Tray): 12' 0" x 14' 8" x 10' 0"
Great Room (Vaulted): 21' 0" x 15' 10" x 25' 0"
Kitchen (Flat): 14' 4" x 14' 6" x 9' 0"
Utility Room (Flat): 13' 8" x 6' 0" x 9' 0"
Bonus Room (Vaulted): 33' 2" x 13' 0" x 11' 4"
Garage (Flat): 35' 0" x 22' 0" x 0' 0"
Garage Storage Bay (Flat): 0' 11" x 8' 0" x 0' 0"
Master Bedroom (Flat): 14' 0" x 16' 0" x 9' 0"
Bedroom #2 (Flat): 13' 2" x 11' 4" x 9' 5"
Bedroom #3 (Clipped): 13' 0" x 12' 4" x 8' 0"
Porch - Front (Flat): 27' 11" x 5' 6" x 9' 5"
Porch - Rear Main Level (Flat): 35' 8" x 7' 4" x 9' 0"
Porch - Screen (Flat): 11' 2" x 16' 2" x 9' 0"
Elevator (Flat): 4' 6" x 5' 2" x 0' 0"